INLET MANIFOLD PIERBURG 7.00373.12.0 OPEL VAUXHALL 1.9 CDTI. Sign up for our Newsletter to receive Special Offers! 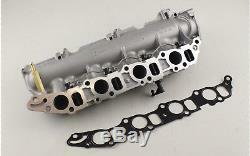 INLET MANIFOLD PIERBURG OPEL VAUXHALL 1.9 CDTI VECTRA C ASTRA G SIGNUM 7.00373.12.0. OE Original Quality Pierburg inlet manifold. In this particular case the PIERBURG manifold has been reinforced in accordnance to revised OPEL / VAUXHALL specifications. 1x PIERBURG 7.00373.12.0 Intake Manifold. Intake manifold with swirl flaps Mode of operation: Mechanical Technical information number: SI 0093. The electrical connections should not be established until the intake manifold has been fitted. This will prevent any kind of electrical blockage from occurring. PIERBURG 7.00373.12.0 Intake Manifold. ALFA ROMEO: 46816020 ALFA ROMEO: 55210201 ALFA ROMEO: 55190238 ALFA ROMEO: 55206459 FIAT: 46816020 FIAT: 55210201 FIAT: 55190238 FIAT: 55206459 LANCIA: 46816020 OPEL: 5850119 OPEL: 93178058 OPEL: 55210201 OPEL: 5850158 OPEL: 93179055 OPEL: 849528 OPEL: 5850180 OPEL: 55206459 SAAB: 55206459 SAAB: 55210201 SAAB: 93179055 SAAB: 93179058 VAUXHALL: 931179055 VAUXHALL: 55210201 VAUXHALL: 5850158 VAUXHALL: 5850119 VAUXHALL: 55206459 VAUXHALL: 5850180. Orders placed around Bank Holidays may incur slight delays. We offer the following postal services. Please note: There is an additional charge in sending packages to any offshore island and Northern Scotland. Enter a daytime contact telephone number. Enter the telephone number for the confirmed address. The cost of returning the item will be at the buyers expense unless previously agreed with APD. Does this part fit my vehicle? How much to send my order overseas? How long will it take to receive my item? Product Listings - Please Read. Other items in our store.. The item "INLET MANIFOLD PIERBURG 7.00373.12.0 OPEL VAUXHALL 1.9 CDTI" is in sale since Thursday, September 21, 2017. This item is in the category "Vehicle Parts & Accessories\Car Parts\Air Intake & Fuel Delivery\Intake Manifolds". The seller is "apd_car_parts" and is located in Swindon. This item can be shipped worldwide.